Download "SECTION 01320 - CONSTRUCTION PROGRESS DOCUMENTATION PART 1 - GENERAL 1.1 RELATED DOCUMENTS"
1 SECTION CONSTRUCTION PROGRESS DOCUMENTATION PART 1 - GENERAL 1.1 RELATED DOCUMENTS A. Drawings and general provisions of the Contract, including General and Supplementary Conditions and other Division 1 Specification Sections, apply to this Section. 1.2 SUMMARY A. 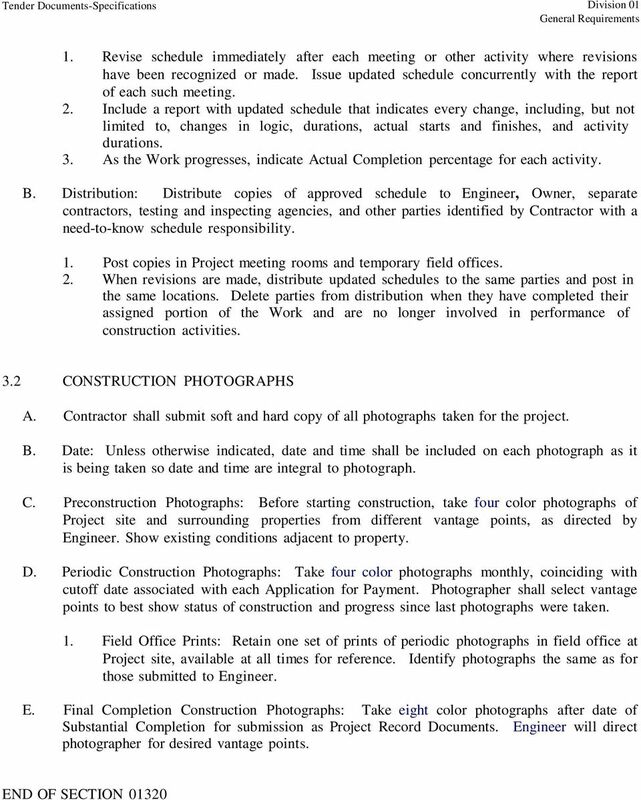 This Section includes administrative and procedural requirements for documenting the progress of construction during performance of the Work, including the following: 1. Contractor's Construction Schedule. 2. Submittals Schedule. 4. Material location reports. 5. Field condition reports. 6. Special reports. 7. Construction photographs. B. Related Sections include the following: 1. Division 1 Section "Project Management and Coordination" for submitting and distributing meeting and conference minutes. 2. Division 1 Section "Submittal Procedures" for submitting schedules and reports. 3. Division 1 Section "Quality Requirements" for submitting a schedule of tests and inspections. 4. 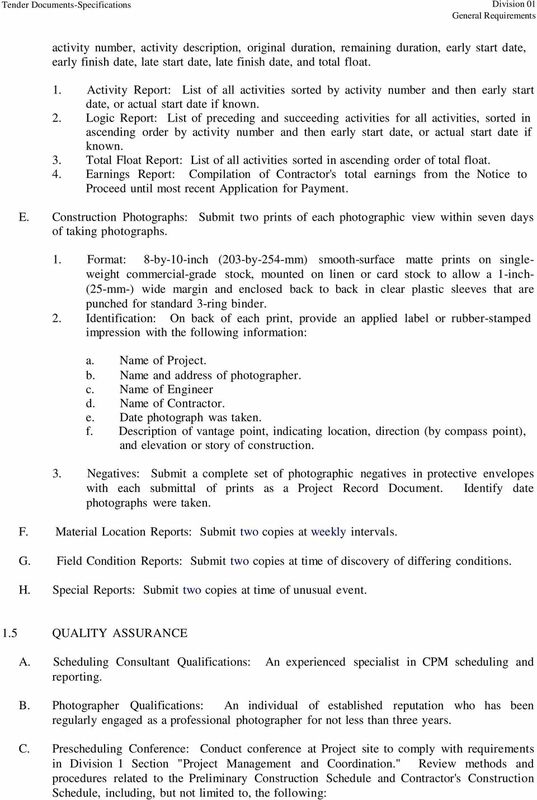 Division 1 Section "Closeout Procedures" for submitting photographic negatives as Project Record Documents at Project closeout. 1.3 DEFINITIONS A. Activity: A discrete part of a project that can be identified for planning, scheduling, monitoring, and controlling the construction project. Activities included in a construction schedule consume time and resources. 1. Critical activities are activities on the critical path. They must start and finish on the planned early start and finish times. 2. Predecessor activity is an activity that must be completed before a given activity can be started. B. CPM: Critical path method, which is a method of planning and scheduling a construction project where activities are arranged based on activity relationships. Network calculations determine when activities can be performed and the critical path of Project. C. Critical Path: The longest continuous chain of activities through the network schedule that establishes the minimum overall Project duration and contains no float. D. Event: The starting or ending point of an activity. 4 1. Review software limitations and content and format for reports. 2. Verify availability of qualified personnel needed to develop and update schedule. 3. Discuss constraints, including phasing work stages area separations interim milestones and partial Owner occupancy. 4. Review delivery dates for Owner-furnished products. 5. Review schedule for work of Owner's separate contracts. 6. Review time required for review of submittals and resubmittals. 7. Review requirements for tests and inspections by independent testing and inspecting agencies. 8. Review time required for completion and startup procedures. 9. Review and finalize list of construction activities to be included in schedule. 10. Review submittal requirements and procedures. 11. Review procedures for updating schedule. 1.6 COORDINATION A. Coordinate preparation and processing of schedules and reports with performance of construction activities and with scheduling and reporting of separate contractors. B. Coordinate Contractor's Construction Schedule with the Schedule of Values, list of subcontracts, Submittals Schedule, progress reports, payment requests, and other required schedules and reports. 1. Secure time commitments for performing critical elements of the Work from parties involved. 2. Coordinate each construction activity in the network with other activities and schedule them in proper sequence. C. Auxiliary Services: Cooperate with photographer and provide auxiliary services requested, including access to Project site and use of temporary facilities including temporary lighting. PART 2 - PRODUCTS 2.1 SUBMITTALS SCHEDULE A. Preparation: Submit a schedule of submittals, arranged in chronological order by dates required by construction schedule. Include time required for review, resubmittal, ordering, manufacturing, fabrication, and delivery when establishing dates. 1. 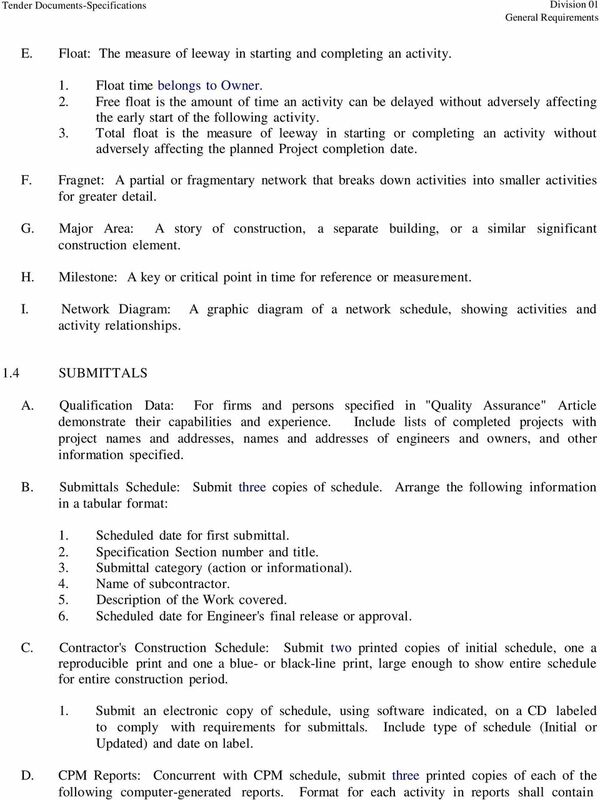 Coordinate Submittals Schedule with list of subcontracts, the Schedule of Values, and Contractor's Construction Schedule. 2. Initial Submittal: Submit concurrently with preliminary bar-chart schedule preliminary network diagram. Include submittals required during the first 60 days of construction. List those required to maintain orderly progress of the Work and those required early because of long lead time for manufacture or fabrication. a. At Contractor's option, show submittals on the Preliminary Construction Schedule, instead of tabulating them separately. 3. Final Submittal: Submit concurrently with the first complete submittal of Contractor's Construction Schedule. 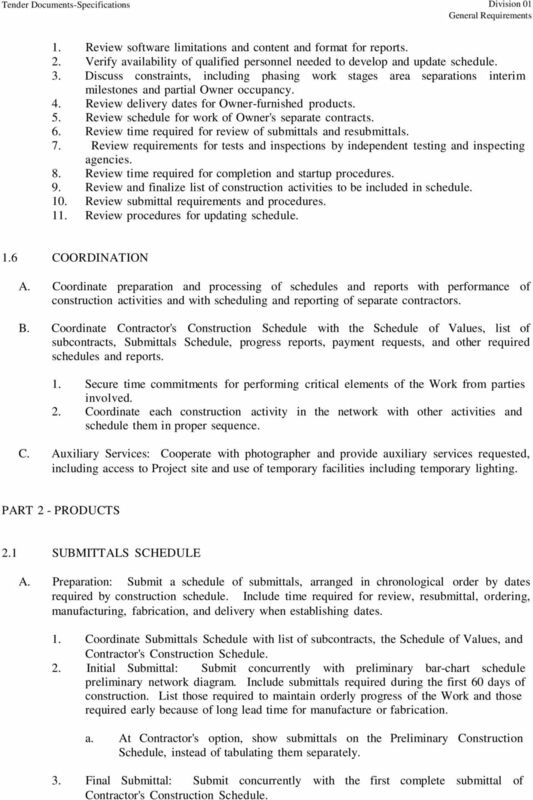 5 2.2 CONTRACTOR'S CONSTRUCTION SCHEDULE, GENERAL A. 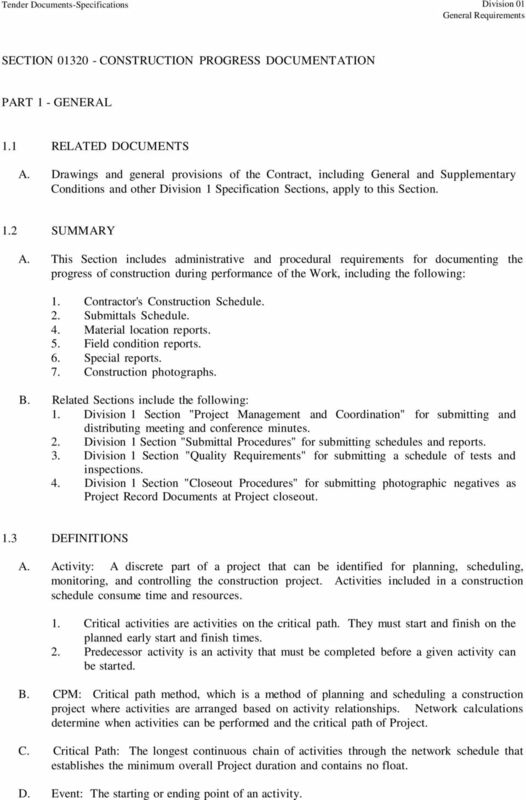 Procedures: Comply with procedures contained in AGC's "Construction Planning & Scheduling." B. Time Frame: Extend schedule from date established for the Notice to Proceed to date of Substantial Completion 1. Contract completion date shall not be changed by submission of a schedule that shows an early completion date, unless specifically authorized by Change Order. C. Activities: Treat each story or separate area as a separate numbered activity for each principal element of the Work. Comply with the following: 1. Activity Duration: Define activities so no activity is longer than 20 (Twenty) days, unless specifically allowed by Engineer. 2. Procurement Activities: Include procurement process activities for long lead items and major items, requiring a cycle of more than 60 days, as separate activities in schedule. Procurement cycle activities include, but are not limited to, submittals, approvals, purchasing, fabrication, and delivery. 3. Submittal Review Time: Include review and resubmittal times indicated in Division 1 Section "Submittal Procedures" in schedule. Coordinate submittal review times in Contractor's Construction Schedule with Submittals Schedule. 4. Startup and Testing Time: Include not less than 3 days for startup and testing. 5. Substantial Completion: Indicate completion in advance of date established for Substantial Completion, and allow time for Engineer's and Construction Manager's administrative procedures necessary for certification of Substantial Completion. 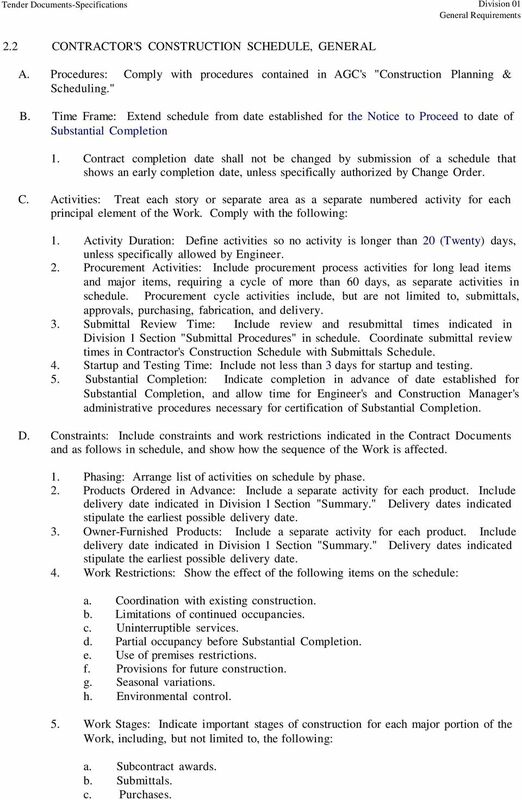 D. Constraints: Include constraints and work restrictions indicated in the Contract Documents and as follows in schedule, and show how the sequence of the Work is affected. 1. Phasing: Arrange list of activities on schedule by phase. 2. Products Ordered in Advance: Include a separate activity for each product. Include delivery date indicated in Division 1 Section "Summary." Delivery dates indicated stipulate the earliest possible delivery date. 3. Owner-Furnished Products: Include a separate activity for each product. Include delivery date indicated in Division 1 Section "Summary." Delivery dates indicated stipulate the earliest possible delivery date. 4. Work Restrictions: Show the effect of the following items on the schedule: a. Coordination with existing construction. b. Limitations of continued occupancies. c. Uninterruptible services. d. Partial occupancy before Substantial Completion. e. Use of premises restrictions. f. Provisions for future construction. g. Seasonal variations. h. Environmental control. 5. Work Stages: Indicate important stages of construction for each major portion of the Work, including, but not limited to, the following: a. Subcontract awards. b. Submittals. c. Purchases. 6 d. Mockups. e. Fabrication. f. Sample testing. g. Deliveries. h. Installation. i. Tests and inspections. j. Adjusting. k. Curing. l. Startup and placement into final use and operation. 6. Area Separations: Identify each major area of construction for each major portion of the Work. Indicate where each construction activity within a major area must be sequenced or integrated with other construction activities to provide for the following: a. Structural completion. b. Permanent space enclosure. c. Completion of mechanical installation. d. Completion of electrical installation. e. Substantial Completion. E. Milestones: Include milestones indicated in the Contract Documents in schedule, including, but not limited to, the Notice to Proceed, interim milestones indicated, Substantial Completion, and Final Completion. F. Cost Correlation: At the head of schedule, provide a cost correlation line, indicating planned and actual costs. On the line, show dollar volume of the Work performed as of dates used for preparation of payment requests. 1. Refer to Division 1 Section "Payment Procedures" for cost reporting and payment procedures. G. Contract Modifications: For each proposed contract modification and concurrent with its submission, prepare a time-impact analysis using fragnets to demonstrate the effect of the proposed change on the overall project schedule. H. Computer Software: Prepare schedules using a program that has been developed specifically to manage construction schedules. 1. Primavera (Original Copy) latest version (at year of installation). 2. Microsoft Project (Original Copy) latest version (at year of installation). 2.4 CONTRACTOR'S CONSTRUCTION SCHEDULE (GANTT CHART) A. Gantt-Chart Schedule: Submit a comprehensive, fully developed, horizontal Gantt-charttype, Contractor's Construction Schedule within 30 days of date established for the Notice to Proceed. Base schedule on the Preliminary Construction Schedule and whatever updating and feedback was received since the start of Project. B. Preparation: Indicate each significant construction activity separately. Identify first workday of each week with a continuous vertical line. 1. For construction activities that require 3 months or longer to complete, indicate an estimated completion percentage in 10 percent increments within time bar. 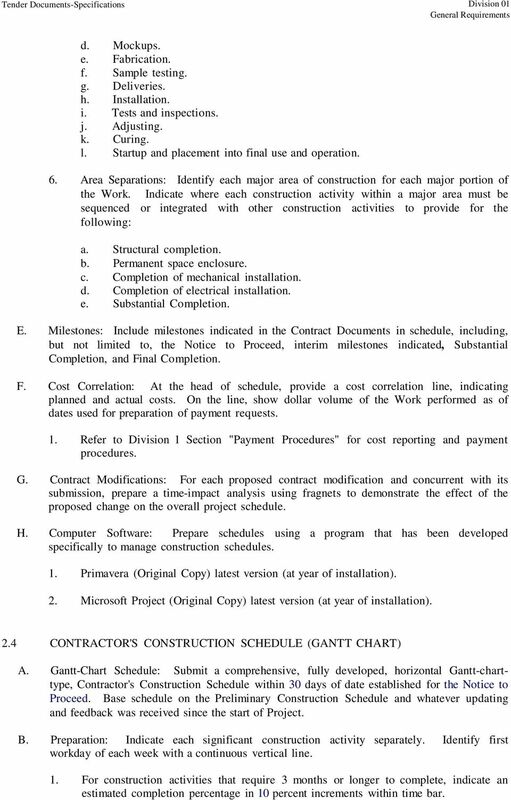 7 2.5 CONTRACTOR'S CONSTRUCTION SCHEDULE (CPM SCHEDULE) A. General: Prepare network diagrams using AON (activity-on-node) format. 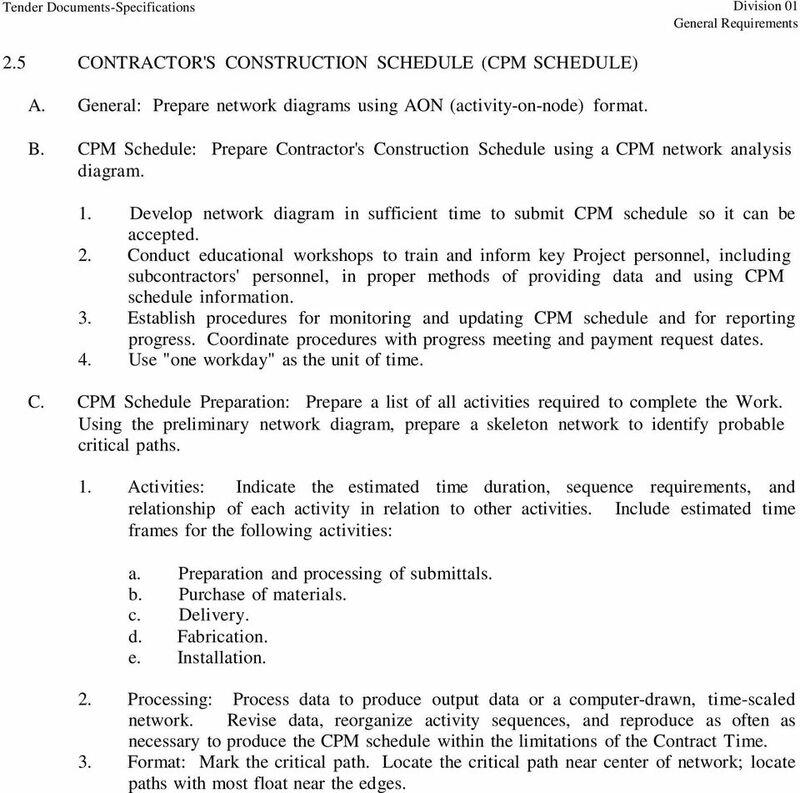 B. CPM Schedule: Prepare Contractor's Construction Schedule using a CPM network analysis diagram. 1. Develop network diagram in sufficient time to submit CPM schedule so it can be accepted. 2. Conduct educational workshops to train and inform key Project personnel, including subcontractors' personnel, in proper methods of providing data and using CPM schedule information. 3. Establish procedures for monitoring and updating CPM schedule and for reporting progress. Coordinate procedures with progress meeting and payment request dates. 4. Use "one workday" as the unit of time. C. CPM Schedule Preparation: Prepare a list of all activities required to complete the Work. Using the preliminary network diagram, prepare a skeleton network to identify probable critical paths. 1. Activities: Indicate the estimated time duration, sequence requirements, and relationship of each activity in relation to other activities. Include estimated time frames for the following activities: a. Preparation and processing of submittals. b. Purchase of materials. c. Delivery. d. Fabrication. e. Installation. 2. Processing: Process data to produce output data or a computer-drawn, time-scaled network. Revise data, reorganize activity sequences, and reproduce as often as necessary to produce the CPM schedule within the limitations of the Contract Time. 3. Format: Mark the critical path. Locate the critical path near center of network; locate paths with most float near the edges. 8 a. Subnetworks on separate sheets are permissible for activities clearly off the critical path. D. Schedule Updating: Concurrent with making revisions to schedule, prepare tabulated reports showing the following: 1. Identification of activities that have changed. 2. Changes in early and late start dates. 3. Changes in early and late finish dates. 4. Changes in activity durations in workdays. 5. Changes in the critical path. 6. Changes in total float or slack time. 7. Changes in the Contract Time. E. Value Summaries: Prepare two cumulative value lists, sorted by finish dates. 1. In first list, tabulate activity number, early finish date, dollar value, and cumulative dollar value. 2. In second list, tabulate activity number, late finish date, dollar value, and cumulative dollar value. 3. In subsequent issues of both lists, substitute actual finish dates for activities completed as of list date. 4. Prepare list for ease of comparison with payment requests; coordinate timing with progress meetings. a. In both value summary lists, tabulate "actual percent complete" and "cumulative value completed" with total at bottom. b. Submit value summary printouts one week before each regularly scheduled progress meeting. 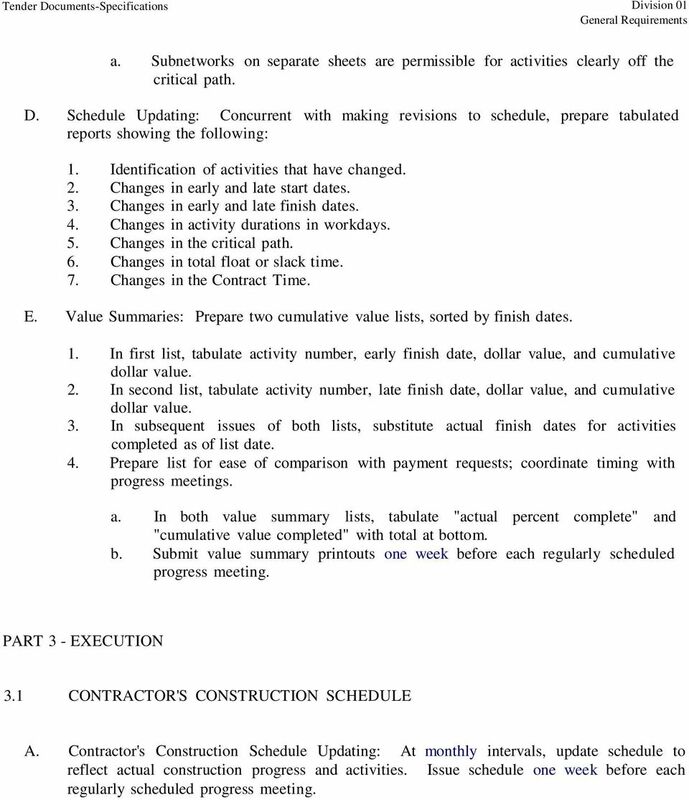 PART 3 - EXECUTION 3.1 CONTRACTOR'S CONSTRUCTION SCHEDULE A. Contractor's Construction Schedule Updating: At monthly intervals, update schedule to reflect actual construction progress and activities. Issue schedule one week before each regularly scheduled progress meeting.